This week, Science for the People is learning how science can shed light on the stories told by our ancestors. 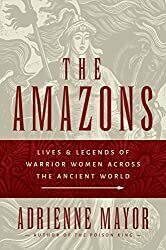 They’re joined by folklorist and science historian Adrienne Mayor, author of The Amazons: Lives and Legends of Warrior Women Across the Ancient World, to learn what archaeology can tell us about legendary warrior women in cultures from around the world. They also talk to anthropologist John Hawks to learn how researchers gain insights from ancient human remains. This entry was posted in Follies of the Human Condition and tagged Adrienne Mayor, Amazons, anthropology, Folklore, John Hawks, mythology, Podcast, science for the people. Bookmark the permalink.